I first started listening to So Cow with 2014's The Long Con. I was really taken in with its bouncy guitars and an energy that I described at the time to remind me of W.H. Walker a bit. 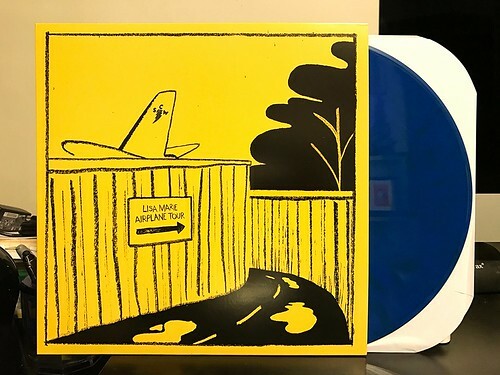 Two years later and So Cow is back with Lisa Marie Airplane on Tall Pat records. Over the two years, aspects of So Cow's sound have evolved a bit, but they have kept the catchy tunes that got my attention in the first place. While it isn't sonically the best comparison I could make, the band that I'm most reminded of when I listen to Lisa Marie Airplane Tour is Reconstruction Site era Weakerthans. So Cow take this in more of a workman like direction, but a similar knack for melodic storytelling and plainspoken vocals make up the core of both bands. The other thing I hear a bit more of this time around is a little bit of Pavement style irreverence. It's bubbling just under the service, but it does steer the album away from the garage based foundation that was more at the core of The Long Con. What this review really is as a long, convoluted way to say that I really think this is a great record and So Cow is quickly becoming one of my favorite bands. I have listen to Lisa Marie Airplane Tour so many times since I bought it. Everyday I've been trying to come up with the words and descriptors to do it justice. Plain and simple; it's a great record full of catchy songs and interesting stories. You should buy it. since i appear to be commenting tonight, the s/t so cow record on tic tac totally (which collects tracks from the two self-released cds) is killer and was my introduction to 'em!